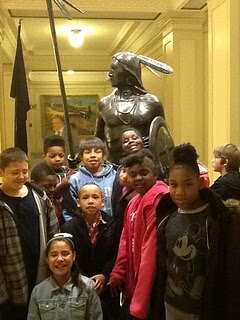 We are a class of 3rd and 4th grade students at Positive Tomorrows in Oklahoma City, taught by Mrs. Shelly Fryer. Read my professional blog on shellyfryer.com. In January 2016 we've switched back over from WriteAbout.com to KidBlog.org. I found that WriteAbout is better for older students, KidBlog is great for my elementary students. Here are all our classroom blog links, including this year's. Old class blogs are archived. We also use SeeSaw to keep digital portfolios on our iPads, and have experimented a little with the new (beta) blogging features of SeeSaw. During Christmas break 2015 my husband and I worked on putting together our classroom Makers Studio. We recorded several videos about the process, including the video below, and I wrote a blog post about it. We also created this page to document our thinking and progress building the Maker Studio.